This is the affordable water-tight container you have been looking for. In fact, here is a set of three of them! They are transparent (per our best practices for geocaching) and conveniently sized. 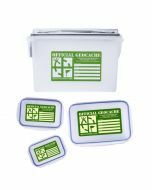 This nested set of lock-n-lock containers comes with the words "Official Geocache" on the lid as well as an Official Geocache all weather vinyl sticker already placed on each container. The containers feature four easy-to-use closure snaps. They are clearly marked with the words "Official Geocache" and also have an all weather vinyl sticker attached to the lid with dedicated space for pertinent cache info. This set includes 3 sizes of containers: 0.24L, 0.5L and 1.5L.